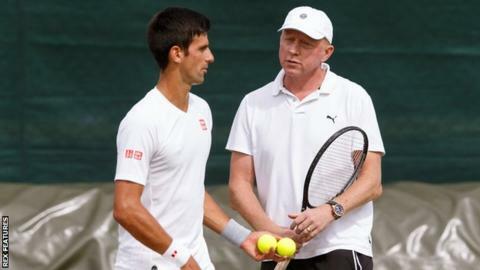 Twelve-time Grand Slam winner Novak Djokovic has parted company with coach Boris Becker. Djokovic, 29, has worked with the former Wimbledon, US and Australian Open winner for three years. The Serbian world number two won six Grand Slams under Becker and held all four major titles at the same time when he won the French Open final in June. "The goals we set when we started working together have been completely fulfilled," he said. "I want to thank him for the cooperation, teamwork, dedication and commitment." Becker described the decision as "mutual" and told Sky Sports: "If somebody would have told us three years ago we are going to win six Grand Slams together, regain the number one spot in the world and just be the most dominant player, I would have signed up for that." Djokovic lost his world number one spot after 122 weeks in November to Britain's Andy Murray in November, having exited Wimbledon in the third round and lost his opening match at the Olympics. He talked of personal issues and also struggled with injuries in a disappointing second half of the season. "I think the last six months have been challenging on many levels," added Becker. "Our hands were tied a little bit because we couldn't do the work we wanted to do. "He didn't spend as much time on the practice court in the last six months as he should have and he knows that." Djokovic, who had beaten Murray to win the French Open, did reach the US Open final in September before losing to Murray in the season-ending ATP World Tour Finals last month. "My professional plans are now directed primarily to maintain a good level of play," he added. "And also to make a good schedule and new goals for the next season." There was a lot of cynicism when Djokovic first appointed Becker, but there is no disputing the past three years have been the most successful of the Serb's career. Djokovic had developed the uncanny knack of losing Grand Slam finals before they teamed up: but perhaps now - just as then - he is looking for a fresh approach. Marian Vajda has been an influential part of Djokovic's team since he was a teenager, and I would be very surprised if he did not play a central role. The unconventional Pepe Imaz - a former player who runs an academy based on the principle that love is the way to true happiness - was in both Paris and London with Djokovic at the end of the season. There's also the possibility of another coach with a playing CV like Becker or Ivan Lendl being added to the team.